The Daily Dose: Don't cry over spilled milk today! That's right. 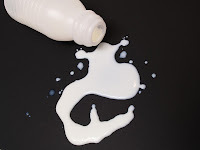 Today is Don't Cry Over Spilled Milk Day, a reminder to practice positivity and optimism and to stop worrying about the small stuff that doesn't matter much at all in the grand scheme of things. ☺ Changing out of my mommy clothes before taking my daughter to storytime. So what if my shirt doesn't exactly go with my yoga pants? Will the three-year-olds really care? And ditto for my hair. Who cares if it's not styled? At least it's combed. ☺ Making sure the dishes are done before my son goes to school. I have enough to worry about in the morning. I think the dirty cereal bowls can wait, don't you? ☺ The fact that I forgot to put an "RSVP by" date on my son's birthday party invitations. His party is during a school break, so now I'll have an excuse to call the other parents to remind them about the event. Problem solved! As you go about your day today, remember the great words of Bobby McFerrin: "Don't worry, be happy!" Wishing you a wonderful, stress-free day! Too funny! I think my husband would say he knows exactly what you're talking about! I know how frustrating it is when parents don't respond to the RSVP! Last year, we held my son's party at an indoor play park, and we needed to give the people there a headcount two days before, which I did. Then on the day of the party, a mom that I thought was going to be a no-show (she hadn't RSVP'd) came in with her twins. Argh. Those kinds of days just feel wrong, don't they? I do think that sometimes letting the little things go is easier said than done. Still, I think it's important that we try. Yes, not worth worrying about small problems, because life would be impossible. Pretty picture. So true! A positive Monday full off inspiration to all! I read about this day on somebody else's blog. I never knew there was such a thing! I love this song! I don't normally stress out about things unless it's something that happens repeatedly so this day is going to be extra relaxing for me. And I think you're right, what child is going to care about what you wear? I hope you're having a good day today. It is hard not to stress about things sometimes. But at this point, I try not to worry and take each day at a time. Fantastic post! I need to be more lax about wearing my mommy clothes too. Not that I make an extra special effort to dress up before I go out. I can't remember the last time I put on make-up, but yeah, the toddlers don't care. And why do I care the opinions of other moms who think the state of my hair has to do with my parenting? You should see what my house looks like - you would know immediately that I've learned that lesson after raising 3 children. You'd think with almost grown children around it would get easier with there help (Bwahahaha, it only gets worse!) - learn to just go with the flow. Did you get in your 20 minute walk today by the way? Right on, Dana! Great post! This 'holiday' is a great reminder to keep everything in perspective. Good thoughts here, shared it well, thanks for sharing.